Rebecca guided the buckboard down into the arroyo, the “highway” back to Rattlesnake Gulch. The problem of Josiah weighed on her heart. On that terrible day, three months earlier, she had torn desperately at Josiah’s pants leg, trying to get at the spot where the blood oozed from the bullet wound in his thigh. Most of the men in the hotel saloon were gathered round the body of her fiancé, who had died with a bullet in his heart. A few stood around her, muttering that she should let the killer die. She didn’t say anything, just shoved the poster at them. “Wanted for Murder/Dead or Alive: Luke Phillips” — with Jimmie’s picture. She kept trying to tear the pants. The man gasped and moaned when she pulled too hard. “You ain’t gonna tear those pants, Rebecca. You gotta take the pants all the way off,” came a voice from the small crowd. Pete squatted down, undid the man’s belt and removed his boots. She grabbed the boots, which wore a pair of silver spurs. “Mighty fine spurs for a down-and-outer,” came from the crowd. By now most of the men had left the dead body and were reading the poster as it passed around. They all looked up when a short, wiry man, dignified and exuding authority despite his size, entered the saloon. On his jacket, a sheriff’s star — the law in Rattlesnake Gulch. She grabbed the poster and held it in front of his face, her face a convoluted mixture of pain, anger and shock. He studied it, turned, stared at the corpse for a long moment. No one stirred in the room. “What happened?” Authority masking the concern in his voice. When Rebecca said nothing, several started at once. Sheriff McDugal pointed to Pete, who explained as best he could. The sheriff looked at the poster again. “That can’t be Jimmie,” he stated. He turned to Pete. “You and Jerry haul this character off to the jail.” Pointing to another man, he ordered, “You ride to Scorpion Flats and fetch Doc Jones. The rest of you get Jimmie’s body over to the morgue.” The morgue was actually just a cool cellar under the jail. As the men followed their orders, the sheriff’s eyes settled on the silver spurs and then met hers. “Missouri?” he asked. The wounded man always fancied the name “Missouri” Smith, but Rebecca had always called him by his given name, Josiah. She was still trying to handle the fact that her father was throwing him in jail. “I told you you were finished with him.” An angry edge replaced the tones of command he had been using with the men. She didn’t want this conversation. She didn’t want any conversation. She needed to be alone, to cope somehow with this sudden storm of events. She hadn’t been this disoriented since her father loaded them on a train headed west, two days after Josiah was arrested. “Well if he don’t hang, he’s leavin’ town as soon as his leg heals,” the sheriff ruled. “Don’t go getting worked up about him again.” His voice still had that angry edge. She shuddered when he mentioned hanging. “I ain’t plannin’ to, Pa. It’s been ten years.” That was the best answer. She didn’t know what she was planning to do. All she knew was the rubble after the flood. He nodded and left. Rebecca cleaned up the saloon. Though she was supposed to work that night, she left. Without conscious decision, she ended up at the jail, a squat, one-room adobe hut with tiny, barred openings for ventilation near the roof. The one door locked from the outside. Missouri was lying on the bench with his head toward the far wall. Pete had removed his pants, put a tourniquet on his leg, and poured a quarter bottle of whiskey on the wound and another quarter into Missouri. She gazed at him, gave an uncertain sigh when he was unresponsive, and went next door to the small building where her father had his banking office. An old friend had offered the job; he accepted it when he decided to get Rebecca out of Illinois. He’d been elected sheriff a year later. She told him she was going home. They didn’t talk much at dinner that night, Rebecca trying to think where to start rebuilding her life. She had agreed to the marriage as a matter of frontier convenience, at her father’s urging, since Jimmie seemed to be a decent person and was not uninteresting to be around. Now her sweetheart of ten years ago was back in her life but might hang for murdering Jimmie if he survived the gunshot wound. Or be chased out of town by her father. There was no grieving. Just rubble. After dinner they sat on the porch watching the sun set. Silence and small talk about weather and crops. Then her father said, “Rebecca . . .” in that fatherly voice she had heard so often as a child. “Those are Willy’s spurs” — half statement, half question. Willy, her older brother, gave her his silver spurs just before he died when he was eighteen. “Well, depending on what Doc Jones says, you may not get a chance.” Doc Jones was also the coroner. That night Rebecca prayed for Josiah. She didn’t pray often. There wasn’t much religion in Rattlesnake Flats — an occasional itinerant preacher would come through. It was easy to forget to pray, until some problem arose. Next morning they looked in at the prisoner. Pete reported Doc had removed the bullet and assured him that Missouri would recover. Rebecca nodded at Missouri, and he nodded back. She turned and went to the hotel to start her workday. Doc Jones had been talking to the witnesses. There wasn’t agreement who had drawn first. There was agreement that Missouri had challenged Jimmie by twice calling him “Luke Phillips,” and that Jimmie had responded in anger. Doc rode back to Scorpion Flats. After an exchange of telegraphs with Illinois, he ruled that Jimmie was Luke Phillips and that there were no grounds for charging Missouri with a crime. Ever since she first saw the wanted poster, Rebecca had been angry with her father. Finally she had to say something. The father did not try to defend himself. 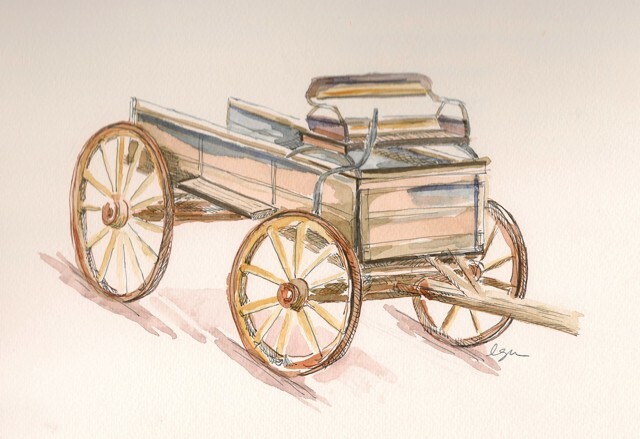 Three months later, she drove the buckboard down the arroyo after a visit with her friend Penelope. The long conversation had only amplified her turmoil. Josiah clearly had no intention of leaving the area, having found work at a nearby ranch once his leg healed from the gunshot wound. She knew she was not the same girl who had been in love with Josiah ten years earlier, at fifteen. Josiah, after several years in prison and who knows what experiences since, was definitely not the same man she had been in love with. Although she hadn’t been “in love” with Jimmie, she had liked him and structured her expectations around a future with him. Expectations now swept away. He was dead. He was exposed as a murderer and jail-breaker. Then there was her father, Sheriff Jock McDugal. She had to pay a certain amount of attention to guiding the buckboard around the rocks and dips of the arroyo. Beyond that she was absorbed with the memories roiling her feelings. She did not notice the darkness in the mountains behind her. When a distant roar broke into her awareness, her stomach clutched; she whipped the horse into a gallop, mindless of route, her whole attention on the edge of the arroyo to find a place she could exit before the flash flood hit. The roar became louder and louder. She saw no exit. Pictures of herself, the buckboard and the horse rolling and tumbling under the violent, dirty wave filled her mind. Screams for help, though she knew they were useless, pierced the drumming of the horse’s hooves, the loud clacking of the buckboard, and the growing roar of the flood. Suddenly a rider galloping along the edge of the arroyo. Josiah. She tried to steer the buckboard to the edge, but was unable to get closer than ten feet without tipping the whole rig over. Josiah forced his horse down into the arroyo and along side the buckboard. He grabbed Rebecca and simultaneously jerked his horse away from the buckboard. Without pausing to lift her all the way up, he scrambled his horse back out of the gully as the boiling wall of water swept the buckboard and its horse under and away. He set her down gently and sat next to her while her screams turned to moans. His heart slowed down; his breathing returned to normal; he looked at her and a soft sob escaped, drowned by her moans. After a couple of minutes he gently lifted her up, forcing himself to ignore the bruised figure under the torn dress. She tried to cooperate but her body refused to obey, aching from being jerked to the horse. Wincing from the pain in his leg, which wasn’t yet fully healed, if it ever would be, he half carried, half dragged her to the shade of a rock. He checked for scorpions and other dangers and set her down. Limping badly, he led his horse to the rock. He took his rolled-up duster coat from behind the saddle, helped her into it, and sat next to her as she made repeated efforts to stop crying, only to break out again almost immediately. The shadows grew longer. Josiah contemplated the Evening Star. Rebecca gradually calmed. Rebecca took a deep, trembling breath. His whole body sagged. He stared at the ground and threw pebbles into the arroyo, where the flood had calmed to a quiet stream. A brilliant red and purple sunset and a darkening sky with more and more stars belied the turmoil that had been. She looked away. She could still see the boiling flood and its roar still filled her ears. Words came to her, only to be rejected. She felt Josiah’s steady gaze but couldn’t bring herself to look at him. Then she heard his spurs jingle. Turning, she saw him unbuckling the spurs. He reached them over to her. He sat frozen for a moment, still holding the spurs out. He slowly rebuckled the spurs and said, “We need to get you home before dark.” He mounted his horse and pulled her up behind him, a dead weight as her body still refused to cooperate. The horse picked its way along the edge of the arroyo, where small streams still meandered. After a mile, they saw torches, horses and riders ahead in the near darkness. The sight of the washed up buckboard sent a wave of nausea over Missouri as he kicked the horse into a gallop, his free arm grasping Rebecca, who was struggling to hang on with what little strength she had. He jerked the horse to a stop next to her father, and Rebecca collapsed into his arms, her tears and sobs returning. “What the — ” shouted McDugal. Missouri turned the horse and galloped off into the darkness. That night he drank a lot of the ranch owner’s whiskey. They walked a few steps further. Missouri rolled a cigarette and stood smoking. He wasn’t watching McDugal ride off. He was seeing what lay beyond the mountain, where McDugal was headed.